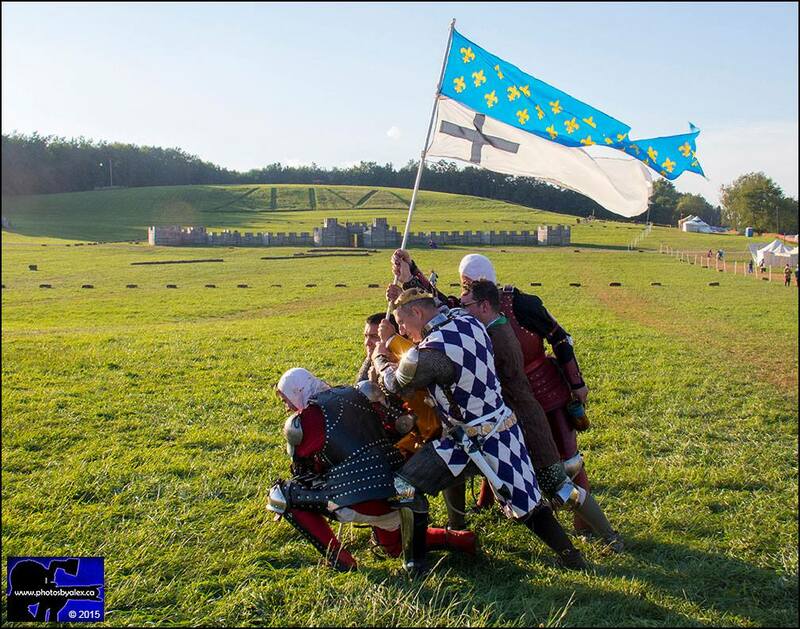 The Combat of the Thirty is an event that takes place at Pennsic based on a historical Deed of Arms that happened in Northern France in 1351. In a nutshell, two garrison commanders challenged each other and it was decided that each captain (French and English) would bring with them 30 men to fight in a sort of melee on foot. The battle must have gone on for some time as both sides needed respites during the battle. Ultimately the French won the day, and those on the English side not killed were taken captive and released for small ransoms. If you want to know more about the actual Combat of the Thirty I suggest picking up Steven Muhlberger’s (Duke Finvarr) book “The Combat of the Thirty” where he looks at three accounts of the battle and gives his insights into why the Deed was so well known in northern France. Duke Finvarr’s web page on historic Deeds of Arms can be found here. My name is John Meyer, or Lord Enzo De Pazzi in the SCA. I portray a mid-14th century Condottiere (Condottieri were essentially professional mercenaries from Italy). 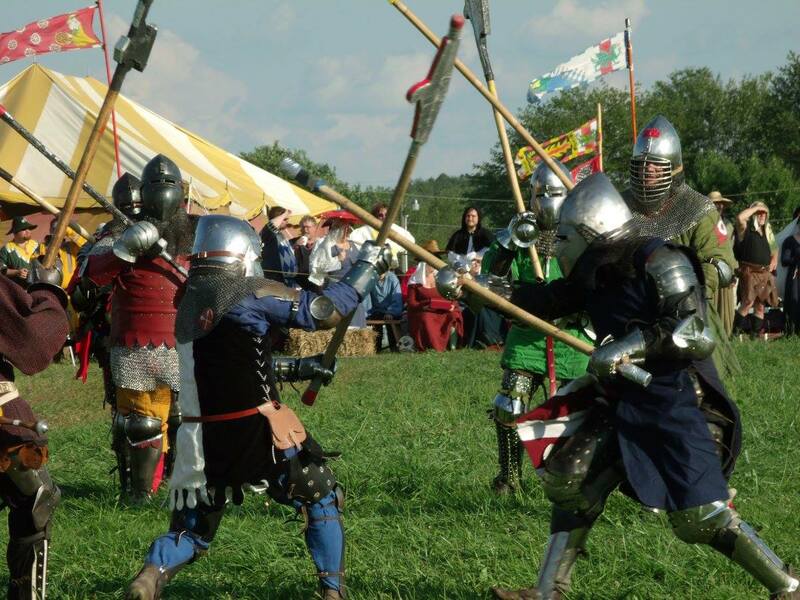 Years ago, I was doing other LARPS and saw pictures of the Combat of the Thirty and immediately said to myself that I was going to take part in it come hell or high water. It spurred me on to learn how to make 14th century armour, eventually leading me into the shop and business I run now (Cliff Side Armoury). If I was going to fight in the Thirty it was going to be in the absolute best armour I could do, not some bent up sheet metal I hacked at with a grinder. 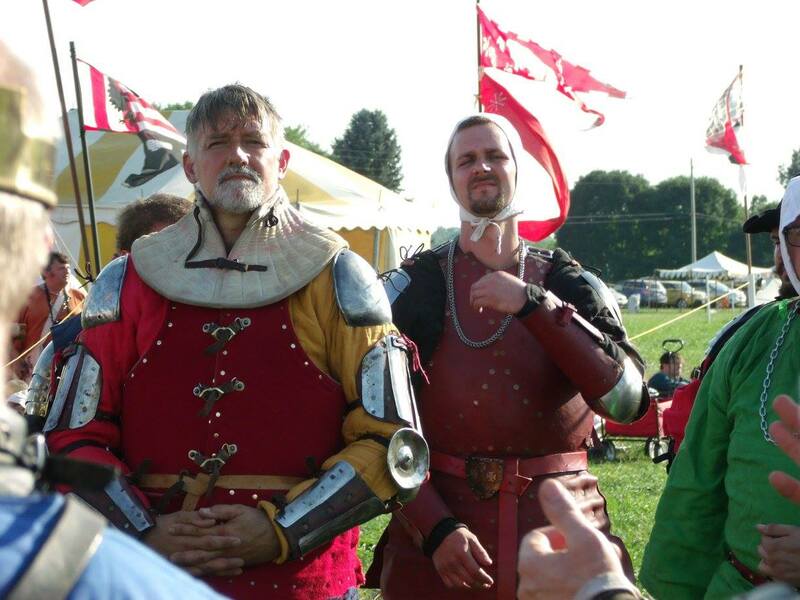 I fought in the Deed for my first time three years ago and have never forgotten it; it was everything I wanted and justified for me a lot of the other things that come with the SCA. Last year, Duke Nigel McFarlane asked if there were any who would step up to be captain. I had spoken with him before and he very graciously accepted my proposal to lead the French this upcoming year. 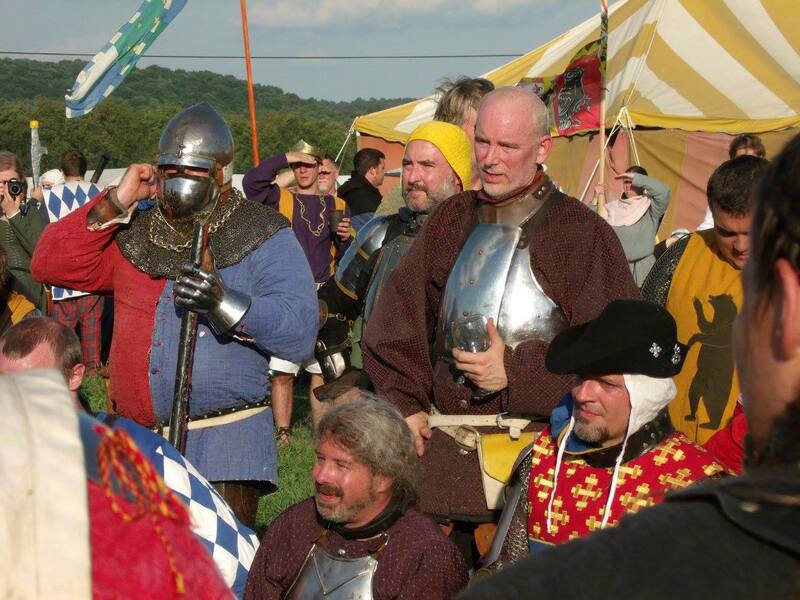 So now I get to live a dream I never could have imagined and stand as Captain of the French this Pennsic…I still find it hard to believe sometimes. What do you need to be in the Combat of the Thirty? 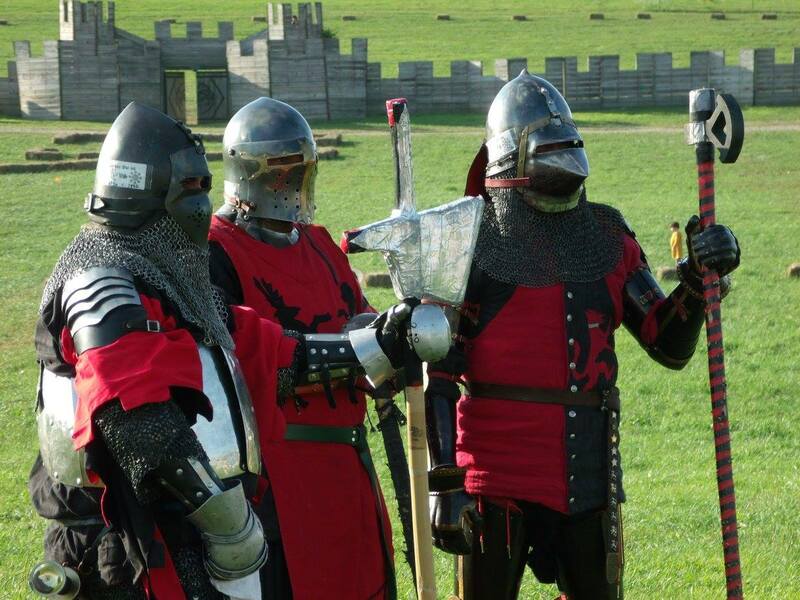 To fight in the Combat of the Thirty requires an appropriate kit for the 14th century. The historical Deed took place in 1351, but most kits from about 1330-1390 are accepted. 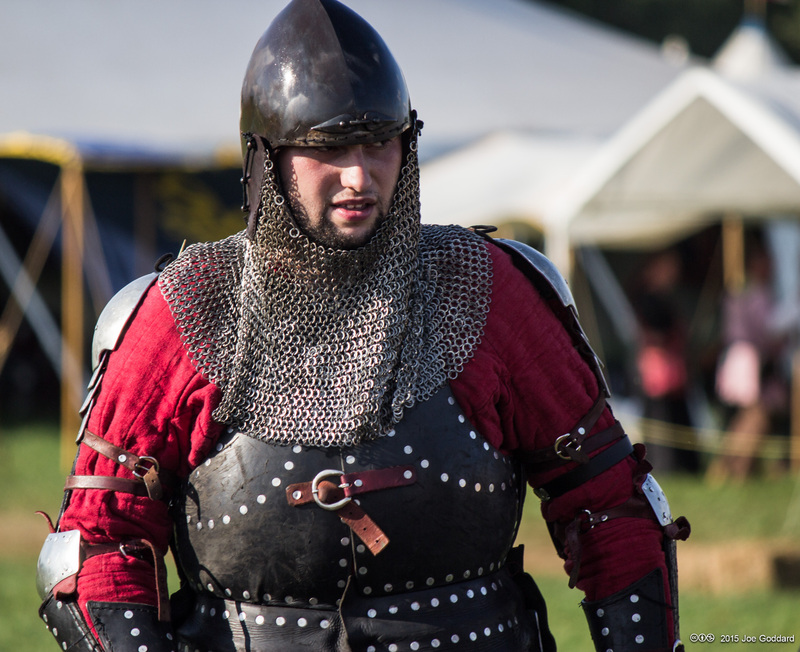 You must be armoured in a fashion appropriate for the 14th century; aventails are required on bascinets and visors are strongly encouraged (they may become a requirement at some point in the future). Greaves are required as well as period footwear. Essentially, look like you stepped out of an effigy. Do your research, find a decade and a specific location and then have at it. The research is key really to getting a good coherent looking kit. DONT SAY YOU ARENT GOOD ENOUGH! I see plenty of guys with excellent kits say they aren’t good enough for the Thirty. Put your kit on, show up and ask one of the captains before just assuming. The worst that happens is you get told what to work on and you make adjustments for next year (If you just read that and went “but that means I have to put my armour on just to have someone tell me I’m not good enough blah blah blah….” then this isn’t the fight for you). Cost can be an issue, but my first kit cost me less than $600; granted, I am armourer but there are tips and tricks which hopefully I can do a class on, or because its 2016 just throw a tutorial up on ye olde facebook. Ultimately if you want to do it, you’ll find a way; it’s that simple or that hard depending on how you look at it. No one’s kit is perfect and every guy in the Deeds I know is always looking to make their kit better one piece at a time. How do I get to be on a team? The reality of getting into the Combat of Thirty is pretty lax. 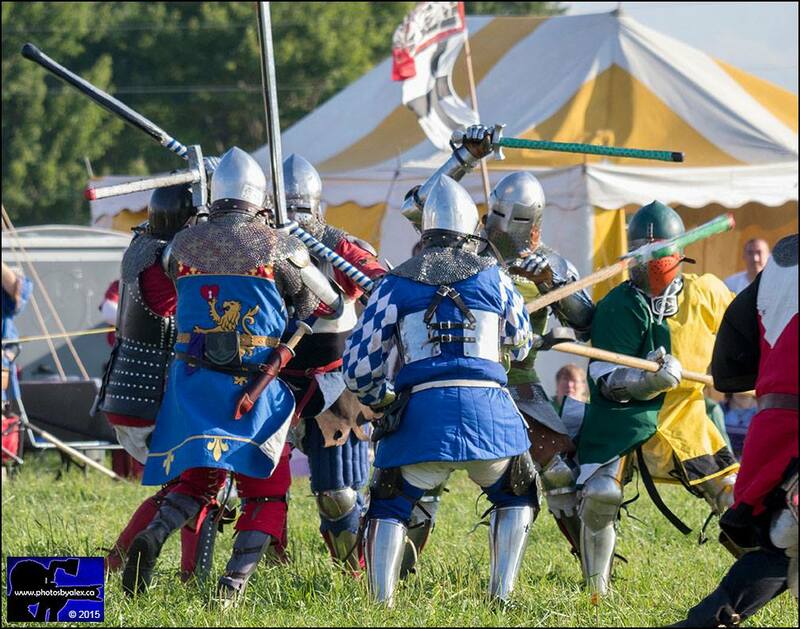 If you want to be prepared and let a captain know that you wish to fight for their side there is the Combat of the Thirty facebook page, or most guys will catch it on the 14th Century Mafia facebook page. If all else fails, simply walk out to the field in your kit before the fight happens and ask one of the captains if you can get in and fight for them. Some might call this a disorganized system but frankly it has worked just fine and it saves the dudes who are about to get clubbed from having to deal with a random non-combatant harassing us about time tables and pie charts. What keeps you in the SCA? I can’t really answer that question. Its a personal reason for everyone, and that in some ways is the answer at least for me. The SCA is filled with people who are never going to feel the sting of combat, who are never gonna puke in their visor and leave every last exertion they have on the field. While these people are often wonderful at other things I find too often they end up dictating a lot of what will happen to the guys who ultimately are out there bleeding and grinding away so we can have cool recruitment photos and keep running one of our biggest allures to new people….violence. What research and kit resources would you recommend? and the Armour Archives “I want to be” section which has a great thread all about being a combatant in the Combat of the Thirty. Go to these sites and just start looking at stuff ’til you can nail down a ten year period you like. There is a whole science to building a period accurate kit, but that goes far beyond the scope of this interview, so for now all I will say is keep everything in your kit documentation to one specific decade and you should be good. Guys get into trouble when they start going “Oh well, I would have had my grandfather’s helmet from Hastings in 1340 blah blah blah”; don’t be that special kind of idiot….I hate those kinds of idiots. Windrose Armoury (Sir Johannes is one of the best guys to talk to about Deeds of Arms and does excellent armour work). Dave at Aesir Metalwyrks seems to do more viking stuff nowadays, but do not be deceived he can make a handsome kit for any Deed of Arms. Jeffrey Hedgecock at Historic Enterprises does amazing work. Jeffrey Wasson is probably one of the best armourers out there today. And Finally Piotr Feret from “Platener” who I believe makes some of the finest reproductions of 14th century armour out there. I kept the list to American armourers with the exception of Piotr Feret; there are many Ukrainian and russian armourers out there as well who are making beautiful work but some of them can be hit and miss so I for now will recommend guys I know can give a great product. There is also my own armour page (yeah that’s a pretty blunt plug), however I am currently not taking orders as I am already outfitting a few new guys for the Thirty as well as building myself a new kit as Captain and a crusader era kit. However drop me a message if ya need help or advice. I got to the point I am now in my craft because of guys who gave up their secrets and as such I carry none. I’d rather tell ya how I do stuff and see you come up with a better way than sit in my dark corner of the shop thinking I’m awesome for not sharing what I know. Just as important as the hard kit is your soft kit. Honestly, I made all of my own clothing because sewing isn’t as hard as you would think, and it’s always nice to not have to deal with another party if I need crap done. I have bought some items though from Historic Enterprises, Revival Clothing, and one of my favorites, “The Purple Needles”. There are also multiple facebook groups filled with absurdly helpful and knowledgeable people to get you equipped for a Deed. XIV Century European Armour, the United League of Armourers, and the 14th Century Mafia page mentioned above. There are hundreds of links and sites and people to help you out. These are just the ones I could remember off hand. If you can’t find the rabbit hole to fall down with these links then this is not the fight for you. I guess all I have to add is start working on getting into the Deeds now! This article isn’t the magic bullet. You will have to go out and research and ask around. Making a kit isn’t as easy as a spun top and a pickle barrel, but it ain’t much harder, honestly. That little bit of extra effort required is always worth it in the end, and it’s good to know as you stand there waiting for the fight to start that everyone around you did their time and jumped a few hurdles to stand beside you. Also, due to the rule set and the contact level, be sure you have a stout heart. If you think you can be hit too hard….this ain’t your fight. If you like to figure out ways to rule lawyer scenarios…this ain’t your fight. If you don’t like rough and tumble then this ain’t your fight. If you wanna beat men into the dust or haggle a man’s freedom in gold coins, then this is your fight. And before I forget, here is the general gist of the rules. • All combatants shall be armed in an appropriate manner to the 14th century. 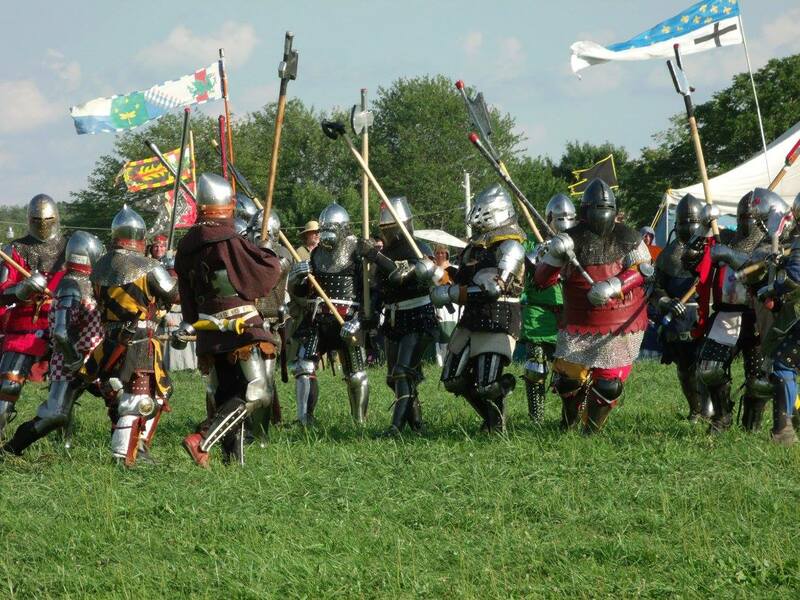 Bascinets must have aventails, greaves are required, maille is strongly encouraged and visors are strongly encouraged. • Combatants are assumed to be wearing plate armour (though things such as gamboissed cuisses may actually be worn if appropriate). As such single handed blows do nothing to combatants. Only two handed weapons and thrusts have a chance of doing harm. • A combatant who is struck three times to the head in quick succession is considered stunned and may be taken captive by anyone who can place a hand on him. • If you are knocked to the ground and someone can place a hand on you, you are captured. • If you are unarmed and someone can lay a hand on you, you are captured. If you are struck with a thrust in an unarmoured region such as the armpit, crook of the elbow, (and aren’t wearing maille like you should be) you are dead, you are only good to the crows now and dead men give no ransoms. • Also bar grills count as an open face, so if you are stabbed in the bar grill then assume it’s a closed casket affair for you and fall over dead. • Captives must follow their captors to the sidelines where they will be dropped off and later have to buy their freedom back in the form of a ransom befitting their station when the fight ends. • If on the way to the sidelines a fight ensues the captive must stand and wait to see if his captor is killed or taken captive. • If you are brought to the sideline as a captive you are out of the fight, unless your captor is KILLED (note KILLED, not captured). • The fight continues until all men from one side are killed or captured. Afterwards those men who have been taken prisoner must offer some ransom to their captor for their freedom. These are typically small trinkets but it is expected that they match your station and be period for the 14th century if possible.